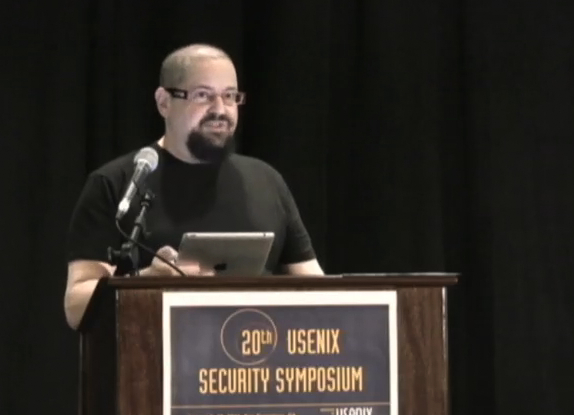 Earlier this month author Charles Stross gave a lecture in San Francisco for the USENIX Security Symposium. He called his talk “Network Security in the Medium Term, 2061-2561 AD” and in it he took the concept far beyond keeping your email password private or your WiFi from being hacked. Network security, according to Stross, will slowly work its way down to a basic need for everyone until it resembles the right to personal safety. Is losing your genomic privacy an excessive price to pay for surviving cancer and evading plagues? Is compromising your sensory privacy through lifelogging a reasonable price to pay for preventing malicious impersonation and apprehending criminals? Is letting your insurance company know exactly how you steer and hit the gas and brake pedals, and where you drive, an acceptable price to pay for cheaper insurance? Then would come the game. Cameras in the phone of every parent. Sensors on the goals; sensors in the ref’s whistle; in the ball; in the lamps that light the field. Yellow cards, goals, offsides, all recorded from many angles and tagged with time, location, temperature, whether for the memories or to limit liability—the motion of 22 bobbing ponytails transformed into lines of light. But some forms of personal data – medical records, for example, or land title deeds – need to remain accessible over periods of decades to centuries. Lifelogs will be similar; if you want at age ninety to recall events from age nine, then a stable platform for storing your memory is essential, and it needs to be one that isn’t trivially crackable in less than eighty-one years and counting. Your very assertion of who you are will become dependent on the reliable and secure functioning of a vast infrastructure: “Robustness and durability are going to be at a premium in the future,” Stross emphasizes. You can view video of the talk or read the full text.